I am a very lucky girl as we got three new cookbooks for Christmas this year: A16 Food + Wine, Thrown Out of an Italian Kitchen: Recipes from Sweet Basil, and Moosewood Restaurant Cooks at Home. Last night I decided to try out one of the Antipasti recipes from the A16 Food + Wine book (A16 is a route through Italy that this seemingly delicious, as I've never actually eaten there, San Francisco restaurant gets its name). "Bruschette is a great way to highlight a seasonal item or make use of an abundant ingredient. At home, if you have pasta sauce or braised vegetables left over from the night before, use it on bruschetta with an added element or two, such as arugula, shaved pecorino, or olives. That's the best part about bruschetta: it's hard to go wrong if you have great ingredients on hand." Taste the ricotta, if it seems bland, mix in a pinch of salt. Divide the ricotta evenly among the brushette, and then top with spoonfuls of peperonata. Serve immediately. Brush olive oil evenly over both sides of each bread slice. Arrange the slices on a baking sheet and toast for 3-5 mintues, until golden brown. Flip them over and toast for 3 minutes. Rub each toasted slice on one side with the cut side of the garlic, and top immediately. 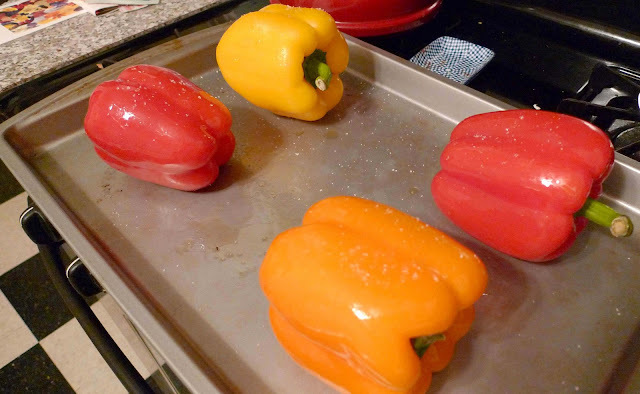 In a bowl, toss the peppers with a dash of olive oil and a pinch of salt, coating them evenly, and then arrange in a single layer on a baking sheet. 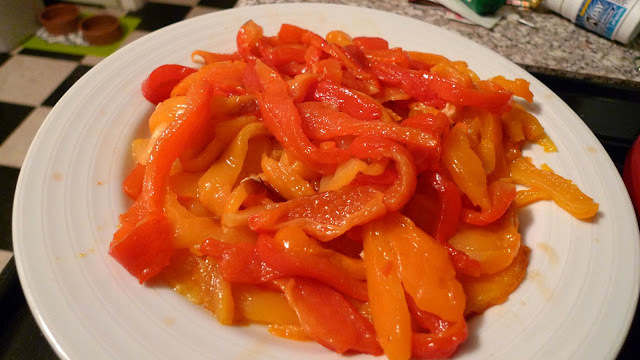 Roast the peppers, turning once about halfway through cooking, for 20-30 minutes, or until the skins have started to blister and pull away from the flesh. Remove from the oven, place in a bowl, and cover tightly with plastic wrap-this creates steam, which will loosen the skins-until cooled enough to handle. In a large pot, heat the 1/2 cup olive oil over medium heat. Dab the capers dry with a paper towl, and add them to the hot oil. Fry the capers for about 1 minute, or until they bloom and become crispy. Stir in the tomato paste and cook for 2 minutes, or until the paste turns from bright red to brick red. Stir in the onion, fennel, chili flakes, and 1/2 teaspoon salt and cook, stirring occasionally, for about 5 minutes, or until the onion and fennel are tender. 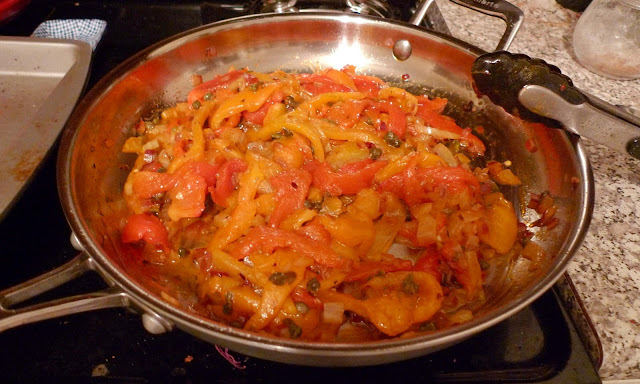 Deglaze the pan with the vinegar, dislodging any browned bits from the pan bottom, and stir in the peppers. Cook for a few minutes, taste for seasonings. 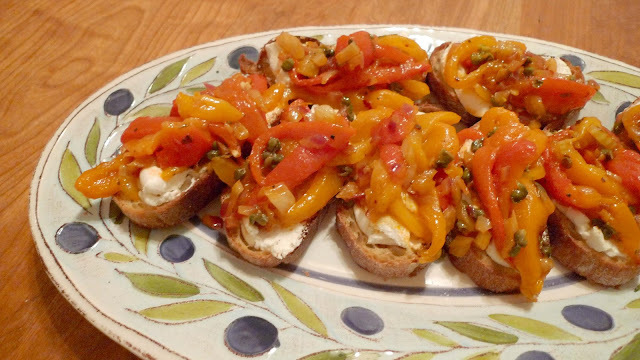 You can top the bruschettas with warm or room temperature peppers.